[Register Here] Riders really enjoyed our scenic 44.1 mile route with 4450 ft of gain the last two years, so it's back! You’ll depart from Foothill after the other rider groups then climb Moody, but descend Page Mill to Arastradero, turn west over to Alpine then turn north. 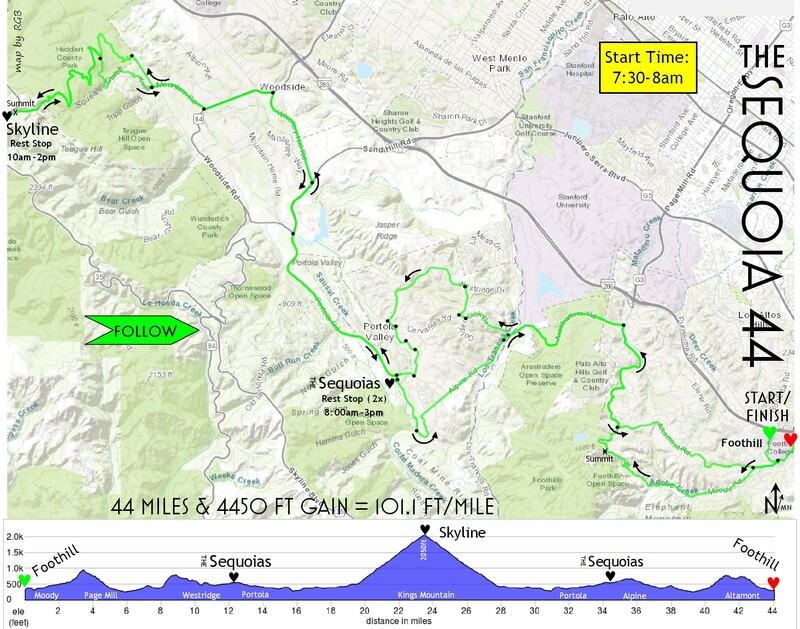 This route provides a pleasant but demanding tour of the Portola Valley/Westridge area before your first Rest Stop at The Sequoias, 12 miles out. You’ll then travel north through beautiful downtown Woodside and climb up into and through redwood studded Huddart Co. Park before rejoining Kings Mountain Road all the way up to Skyline at just over 2000 ft! After your well-deserved Ridge-top Rest Stop, just ahead of the longer riders groups, you’ll return back down Kings Mtn. then back to The Sequoias Stop! Enjoy gently rolling roads back to the colorful finish zone at Foothill College and your well deserved ice-cold chocolate milk and hearty meal.